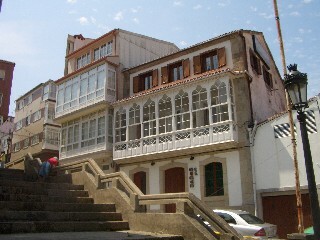 Corcubion sits in its self named ria (bay) a short drive from Fisterra (Finisterre) on the AC550 coastal route. A number of similar towns populate this area of coastline, but Corcubion is definitely one of the more appealing and tourists driving this route frequently stop here for a look around and some refreshment. Right, a typical building the town of Corcubion. There is no shortage of parking in Corcubion (at the side of the coast road) and once free to wonder around you will see that there is a promenade running above a coastal wall for most of the length of the town. The town is built at the foot of one of Galicia's many mini mountains and has a small port, a beach to one side and a little attractive square, all in close proximity. 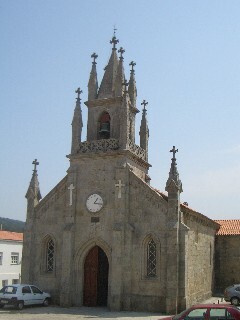 There are also a couple of pazos (manor houses) and a large elegant church to look at above this sqaure. Tourist information is available (Spanish leaflets only) from the main council building which is an impressive stone structure set back a couple of streets from the sea front. There is also a tiny church, just a few feet wide, sandwiched between some other buildings and a number of typical Galician style terraced houses with very colourful gardens. These gardens are "sunken" and lie opposite the promenade. Behind them another street works its way up a gradual incline and there are a couple of cafes in this area (in addition to those facing the small town square). Corcubion has an old quarter, but it is fairly small, although still worth walking around if you want to stretch your legs. You can also walk up the key to look at the boats or back towards the town. You will often find pilgrims visiting the main church in Corcubion or wlaking towards the town. To summarize, Corcubion is a nice example of a small coastal town in Galicia and one that is worth planning into a days drive down this section of the coast. Combine it with Carnota, Muros, Noia and Porto Sin to get a leisurely exploration of some of la Coruna's better seaside towns and beaches. Whilst at Corcubion we had a couple of drinks at a bar overlooking the seafront. Two lagers in frozen glasses plus the best non-gracia tapas we have had and all for a mere 2.40 Euros. In 2014 we called in to the same cafe on route to some towns further up the coast. This time we had two small cokes (220ml). There was no tapas and the cost was nearly 4 Euros. We will not be going there again! 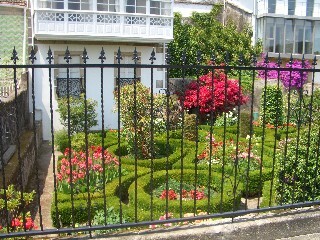 Above, just one of the pretty sunken gardens of the many houses lining the main coastal road as you enter Corcubion.